Neil can carry out replacement of misted up, failed or broken double glazed glass units, ALL UPVC & Aluminium door and window repairs. Replace broken and faulty hinges, handles, jammed and faulty window & door locks, Replacement seals, Patio door repairs, conservatory repairs and servicing and maintenenace of faulty doors or windows. We replace misted-up, steamed-up, failed or shattered double glazing. Replacement Glass Units, Broken and faulty handles replaced, hinges and locks in UPVC & Aluminium windows and doors repaired and replaced. Windowgeeks will replace your misted, steamed up, cracked or failed double glazing units at very competitive prices with a generous 10 Year Guarantee. We are also experts in the repair and replacement of faulty and damaged window & door seals, handles, hinges, locks, key barrels, and locking mechanisms in UPVC, wooden and aluminium doors and windows. We also offer lock replacements, jammed windows and doors fixed, key barrel and handle upgrades, sealant replacement and supply & fitting of new windows and doors, French doors and patio doors adjusted and repaired,, tilt and turn mechanisms repaired or replaced, draughty or sticking doors and windows adjusted to allow correct closure, locking and seal. 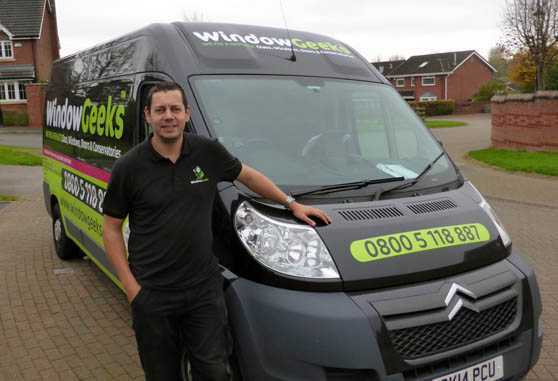 Windowgeeks offer a friendly, honest, clean and reliable service. We only EVER charge for what needs doing and we always honour our promises. With over 25 years experience we run a very successful and ethical business based on good old fashioned customer service backed up with quality products, expert advice and competitive pricing. There are no call out charges ever, no minimum order value and no hidden extras. So try us first. Neil covers Runcorn, Widnes, Frodsham, Helsby & surrounding areas. Just had a dg unit replaced. From the minute I contacted them, I have had absolutely exemplary service. Communication is first class and the attention to detail and fitting is superb. I have no hesitation in recommending them and will be using them again in the future. Thanks Guys, you are all stars!! Had a porch door that was sticking and wouldn’t close properly. Worried I may need a new lock gave WindowGeeks a call for a free quotation. arrived promptly to do the job on an arranged convenient date and time, job completed, very pleased . value for money. Great friendly and professional service – would recommend highly. We had Windowgeeks fix several windows with gaps in them. Plus 6 replacement glazed units. Our engineer Lee was excellent, all work completed professionally and with no drama.